Foley, Gary and Birch, Tony (2014). 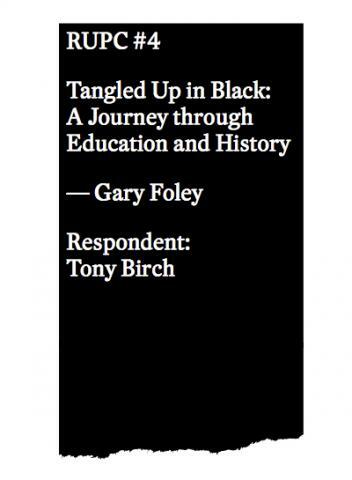 Tangled Up in Black: A Journey Through Education and History. Surpllus Pty Ltd in co-operation with the Research Unit in Public Cultures, The University of Melbourne, RUPC #4/Surpllus #13.4. Based on his award winning doctoral dissertation, Dr Gary Foley's lecture will chronicle the development of the Black Power Movement within the Australian Aboriginal community and the 1972 Aboriginal Embassy. Focussing on a specific and under-researched period that was crucial in Australian history, Dr Foley challenges the prevailing academic understandings of this period and overturns many of the popular misconceptions. His research shows that as a participant and historian, an innovative approach can be found to reveal the achievements and legacy of Aboriginal activism. Dr Foley's dissertation is a seminal piece of Australian political history, unique in its autobiographical approach, and steeped in academic practice. It was awarded a Chancellor's Prize for Excellence in the PhD thesis in the Humanities, Creative Arts and Social cluster in 2014. 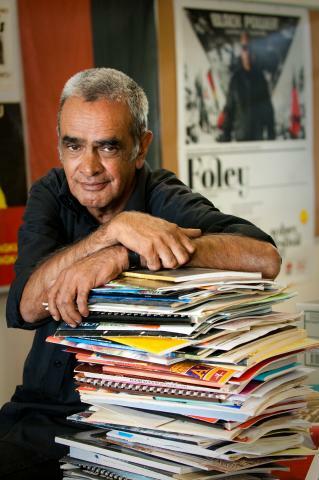 Dr Gary Foley is one of Australia's most prominent commentators and activists. He was born in Grafton, northern NSW of Gumbainggir descent. Expelled from school aged 15, he became an apprentice draughtsperson in Sydney. Since then he has been at the centre of major political activities including the Springbok tour demonstrations (1971), the Tent Embassy in Canberra (1972), the Commonwealth Games protest (1982) and protests during the bicentennial celebrations (1988). Foley was involved in the establishment of the first Aboriginal self-help and survival organisations including Redfern's Aboriginal Legal Service, the Aboriginal Health Service in Melbourne and the National Black Theatre. Most recently he has completed an outstanding report which was also the basis of a documentary on SBS TV and written and performed in his own one-man theatrical show at the 2011 Melbourne Arts Festival and the Sydney Opera House. He is the author of the forthcoming book An autobiographical narrative of the Black Power Movement and the 1972 Aboriginal Embassy and has been published in numerous journals including Griffith Law Review and the Australian Journal of Human Rights. Dr Foley completed his Bachelor of Arts and then gained First Class Honours in History in 2002. Between 2001 and 2005 he was also the Senior Curator for Southeastern Australia at Museum Victoria. Between 2005 and 2008 he was a lecturer/tutor in the Education Faculty of the University of Melbourne. In 2012, he completed a PhD in History at the University of Melbourne.